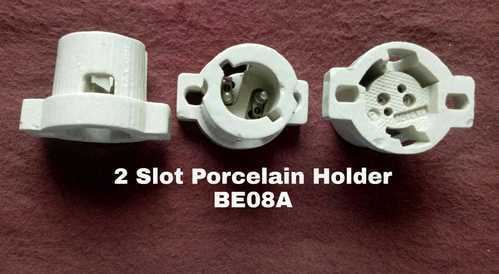 We are the prominent manufacturer, trader and wholesaler of a wide and exclusive range of Porcelain Bc Lamp Holder. These lamp holders are manufactured by our experts using quality material and latest technology as per the market standards. The offered lamp holders are tested in terms of quality before the final dispatch from our end. We provide these lamp holders in diverse packaging at industry leading prices. Available in 2 slot and 3 slot BC Type Lamp Holder. We are the Manufacturer of Folding Study Table & Electrical Accessories for Lighting Fixtures, We leverage our expertise on our world class infrastructure that enables us to manufacture accurate and highly efficient products like lighting accessories electrical light fittings, Led Driver casing, Led driver cabinet, wooden display standee, Display standee, wooden display easel and furniture items. Our production unit is equipped with the best machines that take care of our diverse product range. With our competency to meet client demands for entirely different products, we have made a mark for ourselves in the industry. This has further resulted in a vast clientele spread across the globe.